When leaders are engaged in their military duties they must guard against allowing themselves to be influenced by political considera tions. They must not forget that there are other competent people who are trusted to watch over the political requirements of the situa tion. The only anxiety of the commanding officers who are sending the sons of their country under their command against the enemy to expose themselves to death and who are risking the resources of the country in military operations, consists in the duty of carrying out the patriotic task which the nation expects, be it through fire and glittering steel to death. It is only in such a spirit and with such convictions that military duties can be carried out. It is neither by empty words alone or by discussing politics, nor by lending your ear to the deceitful promises of the enemy, that you can perform your duty. Those whose shoul ders and, particularly, whose heads are too weak to bear the responsi bility of command and duty are infallibly destined to suffer a tragic fate. It is pardonable for a commander to be taken prisoner after he has fulfilled his duty as a soldier and an official to the end accord- ing to the rules of war, and if having exhausted the strength at his disposal to the last shot and to his last breath, he falls into the hands of the enemy without having had the opportunity to shed his blood. There have been Turkish commanders who, when their army has been conquered by an enemy of superior strength, withdrew on their account, went forth alone on horseback sword in hand and threw themselves on the tent of the enemy commander seeking death. Even if we were able to find excuses for a Turkish general who has fallen into the hands of the enemy without having been able to make use of his strength, whether from an accident or any other such cause, history cannot and never will forgive him. Coming generations may derive warnings of this nature from the history of the Turkish revolution. 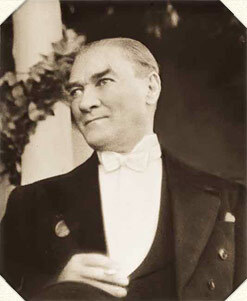 The unfortunate consequences which the recent upheavals in the centre of Anatolia had had for our troops and organisations con fronting the Greek Army did not, after all, lead to the results which the enemy had anticipated. The main thing to which the enemy attributed the greatest importance was the annihilation of our de fence by working directly on the men at the front and, in addition, ex citing the population of the districts in the vicinity of the front and inducing them to rebel. In this direction Constantinople had already been active for a long time. The revolutionary movements in the district of Konia and in Konia itself, which Seinel Abidin s Party was endeavouring to produce, at last broke out in the beginning of October, 1920.